My now husband and myself decided we wanted to get married abroad with the sunshine. We both had our hearts set on the destination where we wanted to marry as we had previously visited a few times before hand. We went to all travel agents and unfortunately none of them provided wedding packages for Altinkum. We then took it upon ourselves to search the internet for private wedding coordinators who work in Altinkum. We really did strike gold when we came across Platinum Weddings website. We did most of the organising by email and the rest by telephone. They were able to accommodate anything we wanted for our special day and understood exactly the way we wanted it. We did have our worries; after all we hadn’t met any of the team face to face (who wouldn’t). Finally the day came to meet the team the first day of arriving in Turkey and we couldn’t praise them enough for how comfortable they made us in their presence. They took my husband and I for all the paperwork, medicals etc, we didn’t have to worry about anything they had everything covered. Showed us the venues for our big day and if we didn’t think they were suitable were willing to look for something else instead. They even met with all the family to go through the day with them. Finally the day came for us to finally tie the knot and we cannot describe in words how wonderful everything was. The guests were took in separate cars, brought all the flowers to us so everyone had them. We had a beach wedding and the venue as so beautiful it went further than anyone’s expectations it was fabulously decorated it was truly amazing. They even had our colour theme matched perfectly. They had a red carpet laid on the sand and my ‘walking down the aisle’ song playing out towards the ocean. The ceremony exceeded all our wishes it really did. The venue for after the ceremony was decorated just as beautiful as the beach the guys really outdone themselves it was more then we could have asked for. 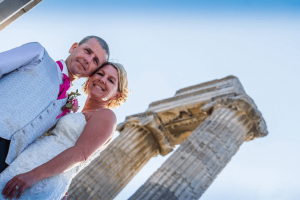 They also took us to two destinations for our picture to be professionally taken one at the Apollon Temple and the other was on the beach for the sunset. Our full day was recorded by video also and it’s a great treasure to be able to watch it back as well as look at the picture to remember our special day. The full team are focused on what you desire and will do anything to achieve your happiness. For the service they provided and what they achieve would have cost four times the amount in the UK then it did with Platinum Weddings. We couldn’t thank them enough for what they did to make our day so special and we organized it all without meeting them. There is nothing these guys can’t or won’t do for you. We are so glad we came across Platinum Wedding and we will be forever grateful to the team for making our special day that little bit more special. I’d like to start this email by saying thanks for giving us our perfect day and more! Between you and Metin we felt safe and well looked after and couldn’t have asked for a better day. Let’s start now when me and my new wife Marie landed in Turkey. We met with Gary and Metin, we did our blood tests which were very easy and for all those that are a little worried don’t be, they’re much better than home. We then went to see the registrar who noticed our paper work from England was wrong (utter dread, thought the wedding was over). Also Gary the solicitor gave us a full refund when they found out the paper work was wrong. Nomatter how busy Metin was the following day they drove us to Izmir were because we had all the paperwork they agreed to do us some new paperwork and stamp it. This took a full day! As our family were doing a boat trip the following day they then got us back in time to see the registrar who confirmed our paper work!! (Yes!!) we were even then allowed to have the boat trip as well!! So they worked round us all the time wo we could also holiday! We then went to a flower shop to pick the colours and it was a perfect match to out colour theme. We sorted the menu and the venue and all other bits we need to do and they even took me for a present for the wife! Now the big day arrived! I was nervous about people getting sand/water on their dresses, as it was on the jetty, but once again no problem. Gary had sorted the run on the beach and reinforced the jetty so it was perfect! As I waited for the bride to come the scene was set and believe me, it was stunning! The wedding was very quick, you have a translator and you don’t have to do the traditional vows (made me feel better). As we come off the jetty Garry had positioned all the photographers and friends and family so they clapped us off to take our seats as man and wife. The food was lovely!! We agreed to pay the first drink for all our gests which once again Gary and Metin took full control over and for the perfect day we had entertainment Djs, they had even sneaked off with my dad to decorate our hotel room! If you’re in doubt about anything please don’t be! They are some of the nicest people I ever met and all they wanna do is make your day perfect! We picked our albums and they are the perfect souvenir to bring home. We can’t stop looking at our perfect day! Thanks you Gary, Metin and all the Platinum Weddings company!! It’s our pleasure to write a testimonial for your website. The day was faultless and all the family still taking about it. The restaurant was superb and Mehmet was delightful. We will be recommending you to everyone, good luck for the future. We would like to say thank you for your help throughout the whole process. We both felt you went above and beyond with the restaurant help. It much appreciated. Thank you again. We both had a lovely day. The boat trip was a big hit as well. A day and night that we will never ever forget, a day that family and friends still talk about, and a day and night that would never ever have happened if I’d decided to do it all myself…… and for all this we will be forever thankful. Thanks you again for helping and for the fantastic idea with the ballons! The photos are absolutely amazing; I am attaching some for your website. We are looking forward to seeing you next summer, all the best to you and your team! Myself and Mr turner have been taking holidays to Altinkum since we got together 10 years ago, in this time and over the years we have traveled with both family, friends and with our 2 young children Poppy (5) and Connor (3). We love Didim and have enjoyed every moment there. We have a very close group of friends who have been married for many years, where their weeding have been held in the UK. 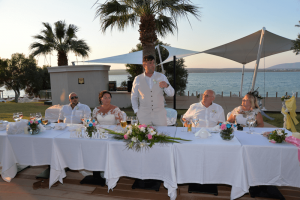 With all this in mind we looked at getting married in Turkey in the resort we love and found Platinum Weddings online. I contacted the company about 10 months before the wedding with and idea of what we wanted. Within 24 hours we had a reply with a number of options. In no more than a month we had booked a 2 location wedding, a date and flights. Gary ensure that we had photos and full details of the locations. 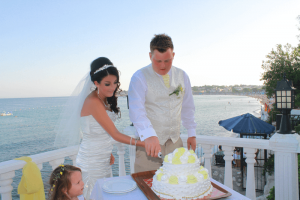 Booking with Platinum Weddings made the whole process of being married abroad much easier. Having to do all this without Gary would have taken days and so much stress, with him it took us half a day with a few beers in-between. 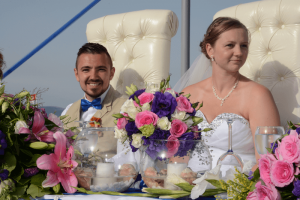 The day was amazing, the beach looked fantastic and I was delighted with the set up and décor. The colours were a perfect match and the flowers were beautiful, all the seats were covered again in matching colours. It all come together and was just how I wanted it. It was perfect. 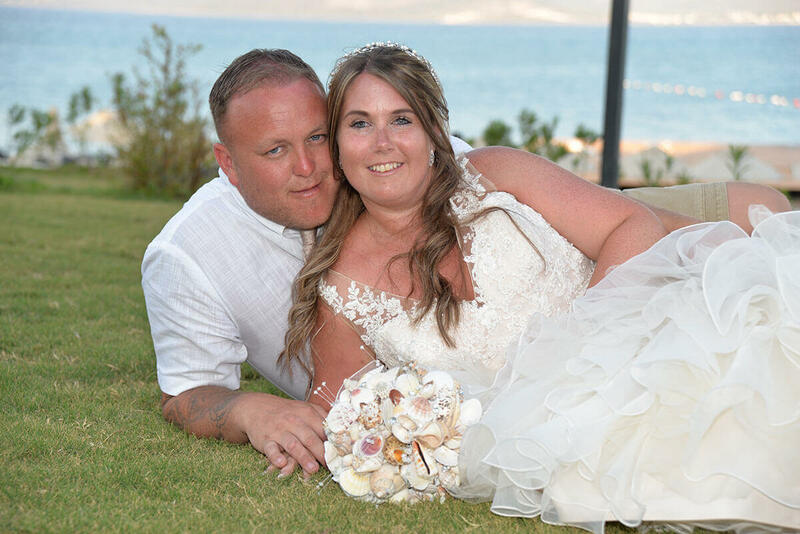 There had been a problem with minsters at the time being away from Didim but this was sorted by Gary and the team which again helped to make the whole process easier being married in a different country. We then went on to the Seaview restaurant where we spent the rest of the night and had dinner. I had asked that the tables be set up in a different way to what I had been shown for previous weddings, which was done and again, just as I wanted. We had a number of children there so had asked that they made them one big table at the back with kiddie food platters along with colouring pens and paper. This again was catered for (the Kids were good as gold). The dinner was a extremely good, we opted for the mixed grill (the Mash was talked about the next day by a number of the guests). The owners and staff of the Seaview were unbelievable. We returned there a number o times during the holiday for dinner and if you are no planning a wedding but reading this review, please try the dinner there, you won’t regret it. Nothing missing from the day, the sun shone, the team of individuals you have where so friendly and nothing was too much trouble. I ran out of tissues, then Burcin came over and gave me a small pack. We would encourage any parents, or bride and groom. What a incredible day you put together and will always recommend your services and wish you all a great future, keep up the good work! 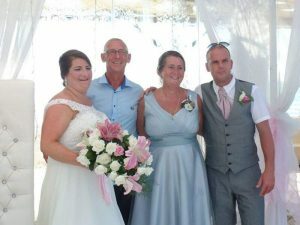 We would like to say a huge thank you personally to Gary for all his hard work and support in the months prior to and also… during our weeding day. Also thank you to Metin for all his help in Turkey and to all the guy’s at the Seaview Restaurant who made our day so memorable. The wedding day was absolutely amazing. We both had a fantastic time and we couldn’t have wanted for a better day. After speaking to all the guests they also had a great, enjoyable and memorable day. Temple for more photos and again this was out of this world. Then onto the Seaview Restaurant where the atmosphere was amazing. The guy’s were so attentive, making us feel so special and nothing was too much trouble the food delicious and enjoyed by all. The whole night passed so quickly we couldn’t have asked for a better time. 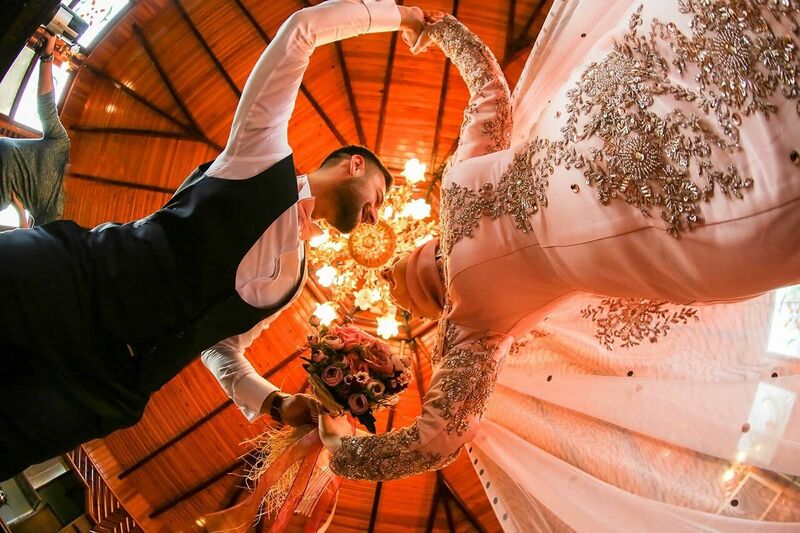 The whole Platinum Weddings experience was brilliant and we would highly recommend anyone who is looking to get married in Turkey to choose them to organize their special day. We would like to thank Gary and all his team at Platinum Weddings for all the personal extras that were so unexpected and made our wedding day so truly memorable and absolutely perfect. Gary and I met at the young age of 15, had a baby at 22 and got engaged at 26, yep 11 years later!!! We got engaged while on a family holiday in Turkey! Lifer took over after the holyday, we had another two babies. We looked at wedding venues and all sorts more times than I care to remember, most of the time we would go excited and come away disappointed, how could we justify spending so much money for one day when we have three kids and the usual bills? In all honesty we just couldn’t. In Turkey and we came across Platinum Weddings Altinkum, we sent an email enquiring not really knowing if we were again just kidding ourselves on. This was our first contact with Gary and his team and I must admit without them we would sitting here 20 years later still not married. They told us the legal bits, what forms to fill out where to take them and at what timescale to do all this (now when I say I hadn’t a clue I’m not even kidding). Sign some papers (sounds simple right?) when we booked the wedding Gary’s team hire the registrar (11 months before wedding date) by the time we got to Turkey they had all changed positions within the consulate and our registrar was now in charge of public toilets but they don’t tell anyone and her diary doesn’t get handed onto the new guy!! (NO WEDDING WAS GOIND AHEAD) we had two options, pretend to be married in from of our family and friends that came to see us marry then get married back home at a registry office or let Gary and Memet jump through so many hoops and loops over the next couple of days. Turkish form needed to be change, translators needed to come in and translate English papers into Turkish papers, then someone official had to stamp them. After visiting Turkey for many years, when I finally popped the question it was pretty obvious that Didim was where we wanted to get married. The beautiful weather, food and people made it a very easy choice. What proved difficult was going to be organizing from England. After doing a bit of research we came across Platinum Wedding website and got in touch. From the word go Gary and his team were great. We had numerous conference calls and emails to get the broad idea of what we wanted, Gary then went away and found some venue options base around exactly what we were after and even when one of the venues we wanted wasn’t going to be available, Gary was able to find one that was even better and fitted around us perfectly. Meet with the venue owners alongside Gary and his team. 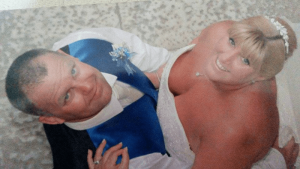 We flew out a week before the wedding and we were met on the Monday of the wedding week to spend, what I thought would be quite a painful day doing all the necessary paperwork and health test, etc. I couldn’t have been more wrong, it was over before midday. Gary had made sure we had sent him copies of the paperwork from the UK so had double checked that we had everything we needed so therefore on the day itself everything went like clockwork. We met the gentleman who would be presiding over our ceremony as well as the translator so it was great to meet the people who would be involved in our big day beforehand. The day itself was perfect. Myself, my best man and an usher arrived early to add some finishing personal touches and theceremony area and the reception area looked amazing. The photographer and the entertainment that had been organized by Gary were excellent and the team were on hand until the final dancer had finished and we got the organized transport home. As I sit and write this it’s difficult no to get emotional because the most important day of our lives was simply perfect and we wouldn’t have changed a single thing. A massive thank you to Gary and the whole team at Platinum Weddings for not only organizing but being such and important part of our wedding. We found the platinum weddings with a friend who saw the beautiful weddings Gary and his team had made, and we had to communicate with them. service was excellent from beginning to end .Answers to any question or concern quickly day was just beautiful and a better wedding day. It was a very hot day, and a wonderfully decorated car pulled up outside our complex my fiancee at the time jumped up from her sunbed and was amazed at what she could see. 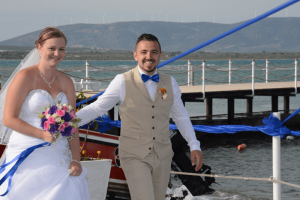 This was our introduction to Mehmet who was driving the vehicle explaining he was collecting a bride we watched this unfold, we was so happy to see this that we arranged to get a card and have a meeting to discuss the potential of us having our special day in this fascinating place. From the meeting with Gary and his team we satisfied ourselves that we couldn’t be in better hands and the day was amazing every detail promised was there and they went over and beyond making our special day when they helped a local Turkish friend who was old and couldn’t arrange transport by sending for her and surprising us at the ceremony. A fabulous company where nothing is too much trouble! thank you Platinum for making our day so special to us and our guests who came out. 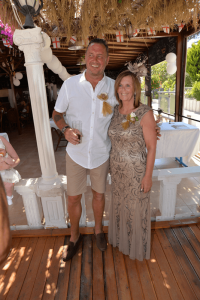 Me and my husband Ryan got married June 2017 in Turkey. 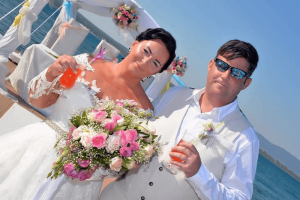 When we decided that we wanted to get married abroad I searched the internet to see how you went about it all and came across platinum weddings and straight away I liked what I saw. I messaged them and they got back to me with prices and packages etc. We decided to book it and Gary was amazing he kept in touch via email or text and was always sending me pictures of what he thought I might like. We decided on a beach wedding with a hand full of guests. I confirmed the colour scheme and theme I was going for and Gary and his team got on with it all. The day after we arrived in Turkey Gary picked us up to take us to do all the required paperwork and I must say I was happy with how quickly it was done. It had only taken a few hours so we had the rest of the day to spend with family. The day of the wedding came and I felt so relaxed about it all knowing that Gary and his team had taken care of everything. The day was amazing and we couldn’t have asked for anything better. Everything was how we imagined it would be down to the last detail. What we loved was that Gary had included my children in the wedding giving them little jobs to do and they kept it all a secret so to see it was lovely. We can’t thank Gary and his team enough the day was perfect and everyone enjoyed it and that was all down to them. I would recommend platinum weddings to anyone and if we ever decide to renew our vows we would definetly use platinum wedding again without a doubt. When our son told us he was planning to get married in Turkey we thought it was going to be very difficult to arrange. I started to research it on line and came across platinum weddings. I got in touch with my future daughter in law and she had found the same one. 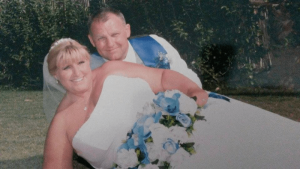 After my son Ryan and his partner Keeley had booked the wedding with Gary, he got in touch with us. He helped us to arrange extras for the wedding that were to be a surprise for for them. He arranged an extra car, decorations for the reception and special hotel for the happy couple to stay the night. They were over the moon it was indeed more than special!! Gary was very professional, but also made us feel very confidant and it was as if he a family friend. We could not have asked for a better day. It was truly PERFECT. 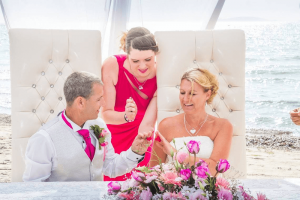 People have asked if it was easy to get married abroad, and I can now confidently say Yes, as Gary and his team at platinum weddings made it seem that way. My youngest son loved his brothers wedding that much, he has said he would love to get married the same way. So Gary may well get another call from us soon. I would not hesitate to recommend platinum weddings.